When you join Facebook, you're joining a community with over two billion people spread around the globe. It helps to have the insight on not only how to set up your profile and add content, but also how to make sure you control who seesand doesn't seeyour posts. 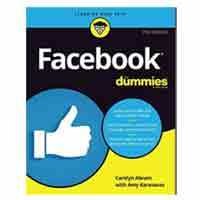 Facebook For Dummies provides the trusted guidance you need to set up a profile, add content, and apply the many tools Facebook provides to give you control of your content.